Employees need a space where they can socialize and recharge. 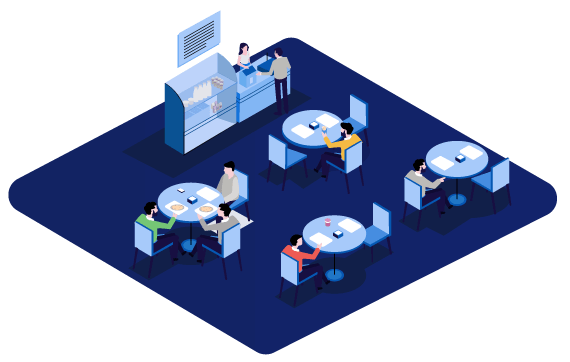 By giving them a well-designed cafeteria, you can ensure they return to work feeling refreshed and productive. Create a relaxing, yet vibrant ambiance with creative wall art, easy-to-maintain plants, and lots of natural light. All these have been known to boost creativity and energy. The cafeteria is your employees’ lunch zone. Give them spacious tables and comfortable chairs so that they can socialize and unwind during their lunch break. Install a television so your employees can watch a quick news briefing or get an update on the game. It also wouldn’t hurt to add a few rec items like a foosball table. Without enough shelves and storage space, you’ll have a messy, cluttered cafeteria with odd items lying around. Get enough shelves to organize everything. Your cafeteria needs, at the bare minimum, a refrigerator and a microwave for your employees to use. They will also really appreciate a well-stocked vending machine or a catering service.